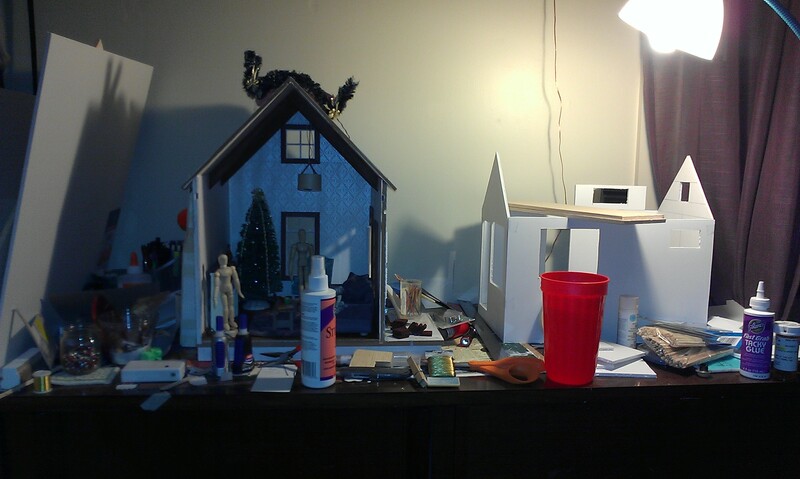 I spent a good chunk of yesterday cleaning up my craft space in preparation for my Undersized Urbanite build. I don’t have much space in our home to do this, and as it was my minis had spread, turning an entire chair and our ottoman into general dumping grounds for items. A few days ago I carefully packed up the Fairfield in preparation for a new build, because I figured two active builds at a time is plenty to keep me busy. I haven’t been working on the Fairfield much lately anyway, just bits and pieces here and there when I feel motivated to do *something* but uninspired or out of time to do something for the Christmas House. Perhaps the most striking thing about my Undersized Urbanite build and the Christmas House is that the UU build has a smaller footprint than the house, but will ultimately be a full living space on the same scale as what is essentially half of a living room. Ha!